This sail is right off a Shellback dinghy, but a new more efficient downwind rig is in the works when we aren't making other peoples' rigs! My wife, Ellie Chase, and I finished up a fabulous 3 days of rowing and sailing in Drake along with almost 40 other boats ranging from 12 foot dinghies to 15 sail and oar boats, to 22 foot daysailers. Drake often got to the lunch stops first because we were able to row upwind and sail downwind. It turned out that most of the time we rowed in tandem. We love this mode of boating for getting around but you have to like to row and be in a good rowboat. And there is no need to ruin the lines of a rowboat by making it be able to sail, as long as you stick to sailing off the wind. We can sail easily on a beam reach down to a run. In the above we maintained 3.5-4kts in maybe 5-10kts total true wind. The Perfect Rowboat, Sailboat, or Both? Do you like the idea of a boat that can row and sail but they often don't like the idea of compromising on one or the other? It is a trade-off. A good sailboat's lines are not good for rowing and a rowboat's lines are not good for sailing. The latter is true mainly because the hull is quite narrow and fine on the waterline, especially at the ends. A fast rowboat's lines just don't provide the stability, often, for sailing and the addition of a slot for the board introduces drag and makes the boat slow for rowing. Wooden Boat's long time manager of their boathouse often cites the Joel White Shearwater as an example. Reluctantly, listening to customer demand, Joel White added the centerboard and it really made a difference in the sailing ability: it made it possible. But it also introduced noticeable drag when rowing: the boat was slower under oars. is very similar to Shearwater, only narrower and longer on the waterline, no daggerboard, and therefore faster under oars. because of the moderate keel to provide some lateral resistance and enable excellent tracking for rowing. We don't have a centerboard, so there is no drag induced (though a tight fitting plug for a daggerboard trunk can fair the slot to the hull reasonably well). I've been asked a number of times, and I just will not add a daggerboard to Drake. She is just a blast to sail downwind and can sail as high as a beam reach quite fast. The sail adds tremendous range when you consider the sail as auxiliary power. But if you want to sail upwind, and row well, you need a boat with a lot of flare in the hull and a shape that provides excellent secondary stability. Joel White's Shearwater and his 18' version of the boat are good examples. Another ideal example is the dory. What I love about the dory is that it is narrow at the waterline and flares out to a generous width, for a rowboat, at the rail, usually 4'8-5'. The Deblois Street Dry is nearly 5' at the rail. 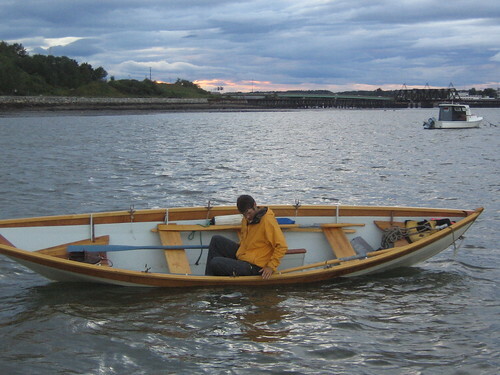 The stability this shape produces lends itself to sailing (see photo of me sitting on D St D's gunwale), but the narrow width at the waterline when the boat is not heeled means that it will row well. The double ended shape of the waterline on a dory keeps the ends fine for rowing ability. Drake shows a similar shape (see photo): narrow waterline, 4'1" at the gunwales provides secondary stability. to see both of these dory types in the flesh and meet two experts on dories: Sam Manning and Walter Wales.